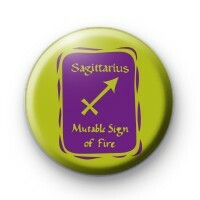 This is a fun bright green and purple button badge with the Zodiac Symbol for Sagittarius right in the middle. If you celebrate your birthday between Nov. 22 - Dec. 21 then you are a Sagittarius. Our star sign badges make cute handmade birthday / Christmas gifts.